Also see Csuri's award-winning "Sine Curve Man," which appears as a texture map in this image. This work incorporates Csuri's "Sine Curve Man," a plotter drawing that won the Computer and Automations award in 1968. In the late 1980s, when Csuri retired from research, teaching and administration and began working full-time as an artist, geometric and figure data for the computer was extremely limited. 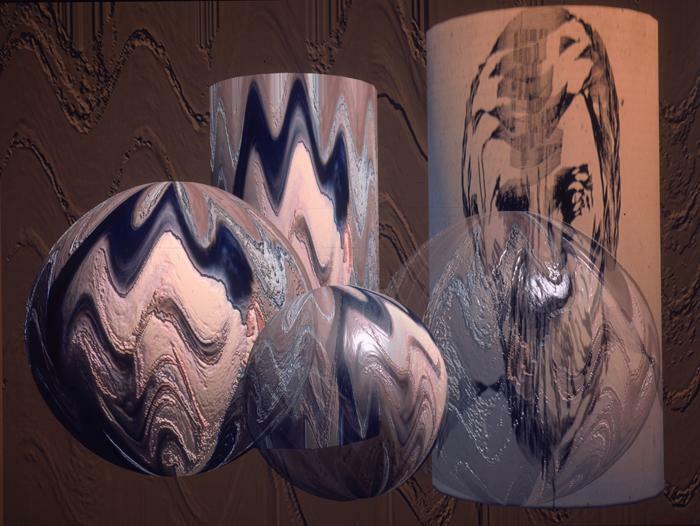 Csuri returned to his oil paintings and drawings and created art in traditional media, which he then used as texture and bump maps in his computer art.